Just ask us for a quotation: we will reply in less than 48 hours. Thanks to new firm software and a network of qualified partners, as far as possible we guarantee very short turnaround times, helping you accelerate the industrialisation of your product. Send a drawing to our fax number (+39 0423 610041) or an e-mail: you will hear from us as quickly as possible. E-Project is a complete service working with you to develop your ideas until your product is sent to you. You can design and engineer your ideas together with us so that you can immediately check their feasibility, following their manufacture step by step through to shipment. If you have an idea but certain aspects stop you from turning it into a reality, why don’t you get in touch with us. The E-press & Turning service not only helps to save time but also to reduce the possibility of errors as well as transportation and running costs. We can press products and, still in-line, immediately carry out turning and milling or, vice versa, we can bend or engrave already turned objects: whatever you require. If you have products requiring these various types of machining, entrusting the job to a single firm is the best solution. The E-Quality & Finishing service is ready to establish the degree of quality in proportion to the critical features of your product. You may request total or spot controls recorded on electronic media, or visual-dimensional checks. We also guarantee all degrees of finishing and surface treatment. You may, for example, request just vibratory finishing or associate it with heat treatments such as hardening, induction hardening, hardening and tempering, case-hardening, AlTiN, TiN PVD and zirconium coatings; or surface treatments such as grinding, shot-peening, polishing, buffing, galvanising (white, yellow, black, etc. ), painting, silvering, gilding, tinning, copper plating, chrome plating, brass coating, nickel plating, anodizing; and also special treatment systems such as Geomet, Zintek, Dacromet, phosphating. If you want a guarantee for the quality and finish of your product then you just have to try the E-Quality & Finishing service. E-Stock Market is a service offered to all customers who need fast supply times. The first step is to decide your monthly, two-monthly, etc. requirements, then we will manufacture the required quantities and have them ready for you. Whenever you request your products you will always find them in stock ready for use. Why don’t you also try this service and discover the considerable advantages offered by E-Stock Market. E-LINK faster response times with consequent shortening of product time-to-market. 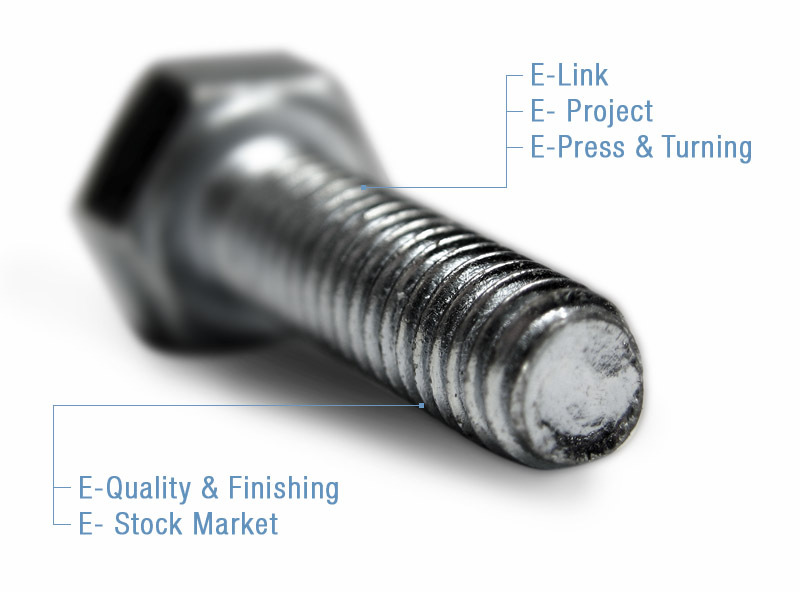 E-QUALITY & FINISHING also total monitoring of the product, which allows in-line direct mounting thereby eliminating internal quality management costs and time, and as many surface finishes as possible, which reduces running costs and times. E-STOCK MARKET fast supply times, immediate availability of your products.